Protests and strikes continue on a daily basis in cities across Iran, with people from all sectors of society taking to the streets in protest of the regime’s corruption and mismanagement of the country’s economy, as well as the mullahs’ oppression of the Iranian people. The following protests were reported by the MEK network inside Iran over the past few days. 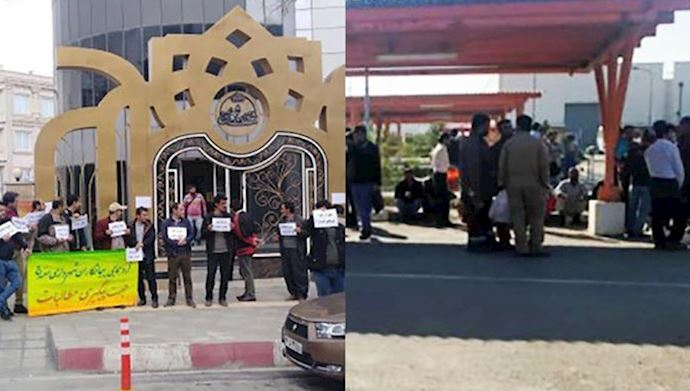 A large group of contract employees currently working in the 9th oil refinery in the South Pars gas field in southern Iran protested the delay of their paychecks and pensions. The protesters are demanding that their paychecks be delivered by the beginning of the Iranian New Year on March 21st “so we can go home without feeling ashamed,” according to one of the workers. In Sanandaj, western Iran, another group of contract workers employed by the city’s municipality rallied outside of the town hall to protest the delay of their paychecks. Slaughterhouse workers in Nahavand, western Iran, launched a strike on Wednesday to protest not receiving their wages for four months. The striking workers rallied outside of the governor’s office in Nahavand to demand their unpaid wages. Nurses at the Medical University in Babol, northern Iran, demonstrated outside of the university dean’s office in protest of not receiving responses to their earlier demands. In Kashan, central Iran, nurses at Beheshti Hospital launched a strike and protest over the hospital’s discriminatory policies and failure to pay their overtime wages or pensions for the past eleven months. In Shush, southwest Iran, a group of retired factory workers from the Haft Tappeh sugar company rallied outside of the company’s door to demand their unpaid pensions. 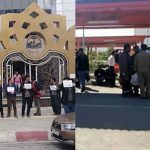 A group of looted clients of the Padideh Credit Firm rallied outside of the prosecutor’s office in Mashhad, northeast Iran, to demand the return of their stolen savings. Looted clients of the Caspian Credit Union rallied outside of the regime’s judiciary in Tehran to demand the return of their stolen savings. The Caspian Credit Union, which is closely linked to the Revolutionary Guards (IRGC) is the largest of several state-backed credit firms that looted billions of dollars from Iranians in an elaborate government-sanctioned Ponzi scheme. A group of municipality workers in Ahvaz, southwest Iran, rallied outside of the main entrance of the town hall to protest the six-month delay of their paychecks. In Asaluyeh, southern Iran, employees of phase 12 in the South Pars gas field projects continued their strike. The workers are protesting their employer’s failure to pay their wages for the past two months and their pensions for the past two years.